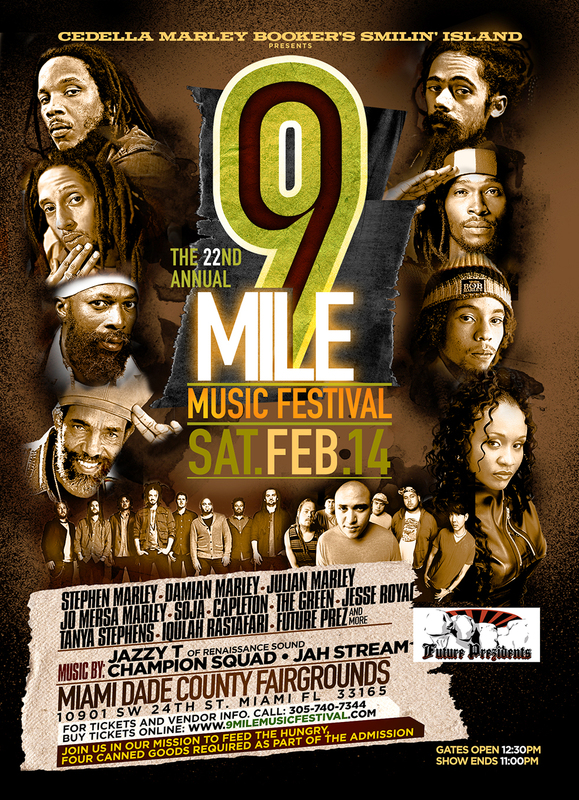 On February 14, 2015, the Miami-Dade County Fairgrounds will host the 22nd Annual Nine Mile Music Festival. The event is operated by Richard Booker, Bob Marley’s brother, who is a client of Santucci Priore, P.L., and previously, the late Cedella Marley Booker, who was Bob Marley’s mother. The festival’s name comes from the village in Jamaica where Cedella Marley Booker was born, raised and gave birth to her son Robert Nesta Marley, a.k.a. Bob Marley, a.k.a. “Tuff Gong.” He was eventually laid to rest in Nine-Mile. This year, the festival comes one week after what would have been Bob Marley’s 70th birthday on February 6th. The Nine Mile Music Festival celebrates life, love, music and helping out the less fortunate. Over the past 22-years, the festival has collected over two (2) million canned goods. Since its inception in 1993, the festival has brought together some of the best reggae and hip-hop to South Florida, and this year’s musical acts are no exception. This year’s lineup includes Stephen Marley, Damian Marley, Julian Marley, Jo Mersa Marley (Stephen Marley’s son), Soja, Capleton, The Green, Jesse Royal, Tanya Stephens, Iqulah Rastafari, Future Prez, and others. Gates open at 12:30, and keeping with tradition, four canned goods are required for admission. For more information visit www.9milemusicfestival.com, https://www.facebook.com/9MileMusicFestival and PURCHASE TICKETS via https://tickets.completeticketsolutions.com/BMM/Online/. In prior years, the highlight of the event was seeing three Marley brothers on stage, at the same time performing their own, and their father’s greatest hits. From Damian Marley’s “Jamrock,” to Steven Marley’s recent song “Jah Army,” to their father’s iconic “Three Little Birds,” the performance was an unforgettable spectacle. This year’s headline set is expected to be no different. If you are a reggae fan, you must treat yourself, at least once in your life, to the Marley family royalty performing these classic songs together.